Weekend 5 arrived, it only seemed a short time since the previous weekend but it had been three weeks! In that time I had gone for days walking around Marsden and Slaithwaite to enjoy the countryside and the bakery again, and I had built a cross between a raised bed and and a Hugel-Kultur bed – more on this another time. The Saturday involved three teaching sessions in the morning and visits to two different sites in the afternoon. The first teaching session covered the “Four Generations Model and Bioregions”. The Four Generations Model basically breaks our lives down into four ages (child, adolescence, adult and elder) with five transitions (birth through to death) which many cultures celebrate with rites of passage. Between these four generations there are 24 critical relationships (eg elder to adult, adult to elder, elder to child, child to elder, etc) all involving the possibility of care, of giving and receiving – reciprocal and generous relationships. It was interesting to reflect that within our current western society many of these rites and relationships are breaking down and this may explain many of our societies problems. The session went on to look at the classic tribal group which has been around for millennia, a group that seems to operate best at about 150 people. It would appear that this is the number of people that one person can relate to effectively, as a result it seems to self regulate and therefore doesn’t need a police force! The space required for this group to live in sustainably is it’s bioregion and we briefly discussed applying Permaculture principles to the group / bio region interactions. We were also encouraged to use this model to help direct our projects. A fascinating topic which set my head buzzing – some further reading and reflection needed here I think! The next two sessions were on Permaculture Economy and this could have taken all weekend, there was so much we could have discussed. We started with a discussion on “What is real Wealth?” and went on to look at forms of exchange and the role of money (as a measure of value, a store of value, a commodity and as a tool of power). the final session looked at “What strategies exist that can support a sustainable local economy?” such as credit unions, community banks, LETS schemes, co-ops, local currencies, etc. We also touched on the “Steady State Economy”, “Circular Economy”, “Idealised Bioregional Economy” and “Blue Economy”. How on earth we managed to fit all of these into two sessions I don’t know, and my reading list has got longer and longer! The afternoon saw a visit to the Bedford Fields Edible Forest Garden and to an allotment run by one of the tutors – both inspiring visits and very educational as we had the opportunity to see PC principles in action and to hear about learning form mistakes! 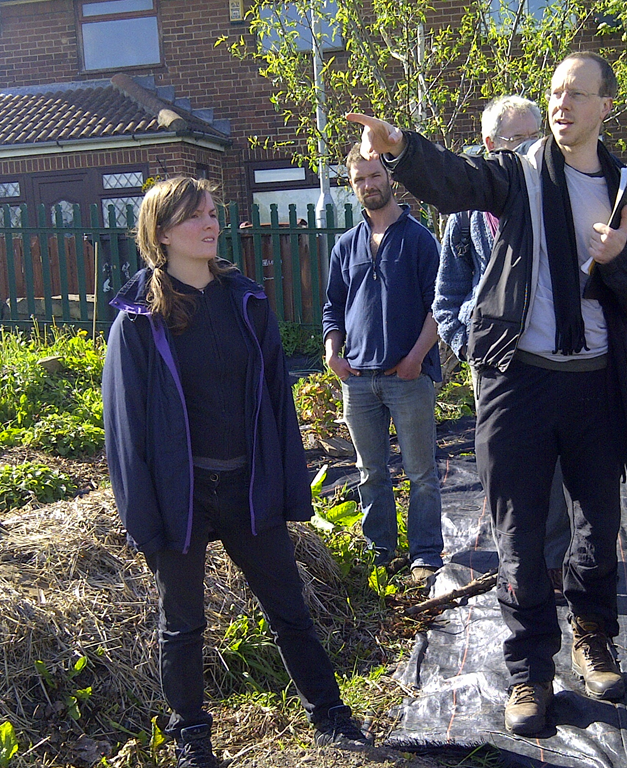 Sunday started with an introduction to aquaculture followed by a session on Permaculture across the world. Andy, our tutor for this session, has a wealth of experience and travel and shared some inspiring stories from around the globe. The rest of the day was about preparing for our Permaculture projects and the rest of the course will see us working hard at designing something wonderful using the skills and knowledge that we have learnt on the course so far. In addition I reckon I will be hunting the Internet, the library and the Amazon bookshelves for books on my every expanding reading list. The only negative thing about the weekend? My bike’s gear cable snapped on the way home leaving me with only the bottom few gears to cycle in but that didn’t bother me too much, I was relatively fortunate, one of my fellow students had a flat tyre and had to push her bike!